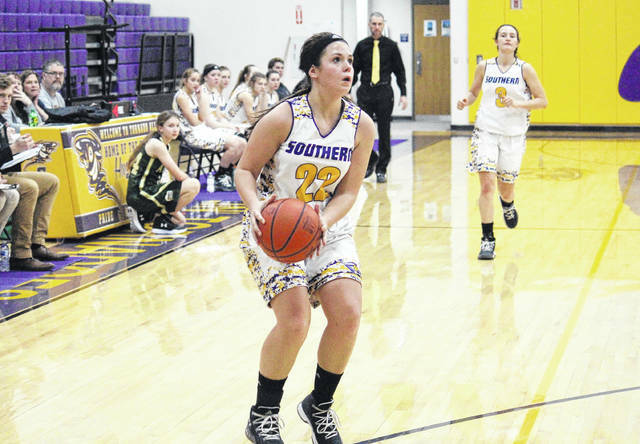 Southern senior Lauren Lavender (22) lines up a two-point shot during the Lady Tornadoes’ 64-45 loss to Athens on Wednesday in Racine, Ohio. Southern senior Paige VanMeter (12) is tightly guarded by Athens junior Kaylee Stewart (32), during the second half of Wednesday’s non-conference girls basketball game in Racine, Ohio. RACINE, Ohio — The Lady Bulldogs were long overdue for a win, unfortunately for Southern, they weren’t waiting any longer. The Athens girls basketball team snapped its 10-game skid on Wednesday night in Meigs County, defeating the Lady Tornadoes by a 64-45 count in non-conference play. Southern (5-14) started the night on the right foot, jumping out to a 13-8 lead five minutes into play. However, Athens (3-16) ended the first quarter with an 8-1 run and a 16-14 lead. The Lady Tornadoes tied the game at 18, 3:30 into the second quarter, but never regained the advantage. The Lady Bulldogs led by as many as 10 in the period, but settled for a 32-23 halftime lead. The teams played evenly through the first 2:40 of the second half, each side scoring five points, but Athens outscored SHS by a 15-to-4 count over the remainder of the third quarter and headed into the fourth with a 52-32 lead. The Lady Bulldogs never led by more than 19 in the finale, but scored a dozen points to seal the 64-45 victory. The Lady Tornadoes shot 14-of-50 (28 percent) from the field, including 1-of-2 (50 percent) from three-point range, while Athens shot 20-of-63 (31.7 percent) from the field, including 4-of-25 (16 percent) from deep. At the charity stripe, SHS shot 16-of-35 (45.7 percent) and AHS shot 20-of-32 (62.5 percent). The guests won the rebounding battle by a 46-to-40 count, including 16-to-13 on the offensive end. Southern committed 15 turnovers in the game, four more than AHS, but the hosts claimed advantages of 9-to-8 in assists and 10-to-8 in steals. Both teams rejected two shots in the contest. 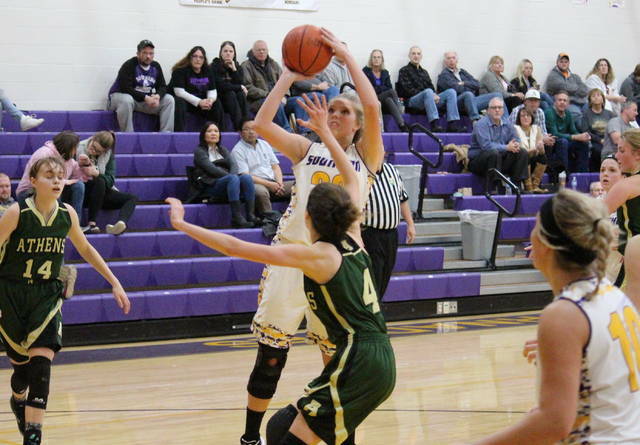 SHS senior Lauren Lavender led the Purple and Gold with 10 points, followed by Phoenix Cleland with nine points and three assists. 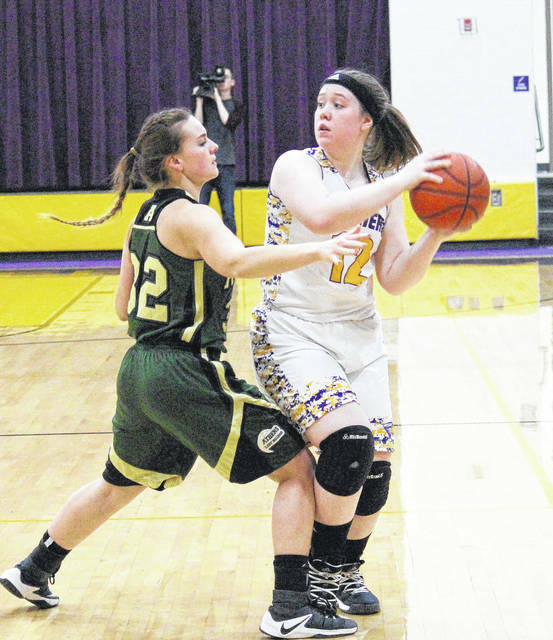 Josie Cundiff hit the team’s lone three-pointer and finished with eight points and seven rebounds in the setback, while Baylee Wolfe and Jaiden Roberts both scored six, with Roberts grabbing a team-best nine rebounds. 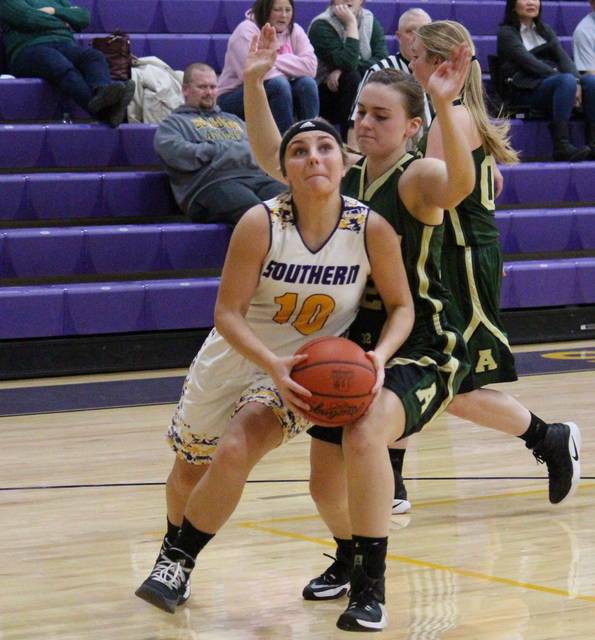 Paige VanMeter, Shelbi Dailey and Bailee Floyd each scored two points for the Purple and Gold, with Dailey recording seven rebounds. Cundiff led the Purple and Gold on defense with four steals, while Dailey had one steal and one block. AHS sophomore Laura Manderick paced the guests with 28 points, nine of which came from beyond the arc. Lilly Mills posted a double-double of 16 points and 16 rebounds for Athens, while Emma Harter finished with 10 points and eight rebounds after scoring eight in the second half. Bella Tan contributed five points and three assists to the Lady Bulldog cause, Mindi Gregory and Kaylee Stewart both added two points, while Kyleigh Heller chipped in with one marker. Mills led the AHS defensive charge with three steals and two blocks. After a trip to South Gallia on Thursday, Southern will be back on its home court against Eastern on Monday. This marks the second non-league loss of the week for Southern, which dropped an 80-41 decision at Williamstown on Monday. In that game, Cundiff led the way with 15 points, followed by Wolfe with nine points, six rebounds and three assists. Phoenix Cleland marked eight points and led the SHS defense with two steals and a block, while Roberts scored seven and Lavender scored two.